Scooters have been popular among children and teens for many years and that popularity is not declining. Even adults enjoy riding scooters for various reasons from exercise to simple entertainment. It is a viable option to a standard bicycle and provides many of the same benefits. The perfect scooter is easy to find when you have all the right information. Things such as the weight of the skateboard, and other factors can reassure you that you have the quality you need. 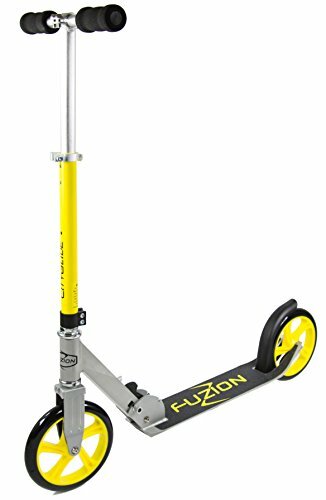 Our pick, Fuzion Kick Scooter, is a great choice for children ages 5 and up. Scooters come in many different colors, sizes and styles. When you are looking for a scooter, the most important factor to start with before you even look at one, knows who you are buying it for. If you are buying for a child, there will be different considerations to look for than if you are buying one for yourself. You will be looking at size, handle style, number of wheels, construction materials and other factors as you do you research. This guide will help you know exactly what to look for and how to compare the different scooter models so you can choose the right one for your needs. With all of the different styles on the market and the different choices that you will have, having as much knowledge as possible about these scooters will make the entire research and purchase process simpler. If you’re looking for an alternative method of getting from place to place or you want a fun new way to exercise, you need to consider the Cityglide Scooter from Fuzion. This scooter features a deck that is low to the ground and lightweight. The tires are oversized and made from polyurethane that will provide a smooth, secure ride even on bumpy city sidewalks. The Cityglide Scooter can be folded up for easy storage and transportation. The large rear brake provides safe stopping. The handles bars are adjustable and feature a telescoping ability that allows you to raise it to whatever height you need. 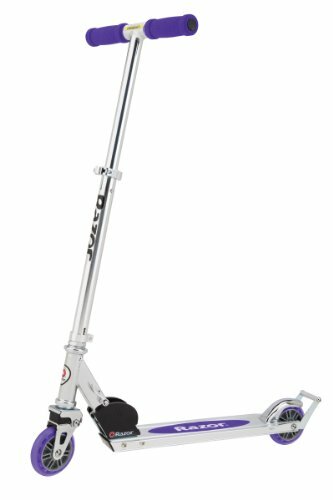 Although the Cityglide Scooter can be ridden and enjoyed by children and teens, it is the perfect adult scooter and support riders up to 220 pounds. This is a great gift for anyone who loves spending time exercising, enjoying the outdoors or just having a good time but who wants an alternative to a regular bicycle. If you want a different way to travel from place to place, commute to work or school, or just exercise, the Pulse Big Wheel Scooter is what you are looking for. It is perfect for adults and children and can hold up to 140 pounds. The Pulse is made from aluminum that is aircraft-grade and built to last for years. Features include extra-large urethane wheels that measure 8” in diameter, soft hand grips that help to reduce vibration when you are traveling over rough or bumpy roads, a wide deck that provides plenty of foot space and much more. The low to the ground deck means less pushing and more gliding and the 3 second folding ability means that you can easily carry it with you wherever you are going. It has a kickstand and shoulder strap as well. The Pulse scooter weighs about 8 pounds. The deck also features a non-slip surface for more secure riding and the steering features a front head-tube that has over 60 mini marbles and lubricant to make steering smooth and easy. Whether you are an adult, teen or child you will love the performance and comfort that the Pulse Scooter provides. Razor is one of the most well known brands in scooters and for good reason. They make quality and reliability top priority and are known as an excellent manufacturer. This Razor A2 continues the company’s tradition of high quality products with its spring less front wheel and shock system and updated deck designs. The rear fender brake is patented and helps reduce those lurches forward from using front brakes. The A2 by Razor is easy to carry and fold due to the folding mechanism and makes storage a breeze as well. Construction of the Razor A2 is from aluminum that is air-craft grade, providing you with s sturdy, long lasting scooter that will stand up to years of use. The spring less shock system is responsible for smoothing out your ride so it is not as bumpy and rough, even on rough or bumpy pavement. The wheelie bar adds even more fun to your rides. Other features of the A2 include 98mm inline wheels and an enhanced finger guard as well. The A2 weighs 6 pounds and can support up to 143 pounds. It is recommended for ages 5 and up and is not really an adult scooter. There is a 6 month warranty on this scooter as well. Consumers will be able to choose from green/silver, red, blue, black and purple. A scooter is an excellent way for kids and teens to burn off excess energy but that is not all they are good for. Teens and adults use scooters to get back and forth to work or school and for exercise as well. With so many kinds of scooters available it may be difficult to pick out the right one for you or your child. We have reviewed three top rated scooters that are excellent for all kinds of activities from exercise to commuting to recreation. The first top rated scooter is an excellent choice for children and provides them with an excellent scooter that is a lot of fun to ride. The other two choices are great for teens and adults and can handle weights of up to 220 pounds. If none of the three top rated choices are what you are looking for, learn more about the available scooters on the market buy reading this buyer’s guide. We will teach you the differences between the different types and how to sort through them all so you can make an informed decision on the perfect scooter for yours or your child’s needs. Who you are purchasing a scooter for is an important consideration. If you are looking for a scooter for yourself or another adult, you will need to make sure that it has certain characteristics that make it a good choice for adults. The same premise applies to purchasing a scooter for children. Below we have listed a few considerations that you will need to think about when you are buying a scooter. We have separated these points into two categories: kids and adults. The deck of a scooter is very important as this is the part that you or your child will be standing on. There are several factors to look at when it comes to the scooter deck. We have listed these characteristics below so you know what to look for during your research. Deck Width – Look for a scooter that has a deck wide enough to place your feet side by side. This can be a lot more comfortable for people than one that requires your feet to be one in front of the other. Riding with your feet side by side is much more comfortable for longer commutes. Another benefit to having a wider deck is that it makes it easier to alternate your kicking foot so that both legs get an even workout. Deck Length – Another consideration that you should give attention to is the length of the deck. A longer deck will be necessary for adult riders, especially those that have larger feet. Short decks can require foot exchanges that can get your feet tangled or you may have to hop from one foot to another. Keep in mind that frequent hopping on the deck of the scooter will wear it out faster and require a replacement to have to be purchased. Deck Weight – Weight is one of the many important factors to think about when researching scooters. A sturdy, durable deck is very important for adult riders because more body weight and stress will be put on the deck. Lighter decks will be easier to carry around but if you are using the scooter for work commutes, you will want to invest in the stronger decks. Scooters can be made from many different materials but the sturdiest and most common is aluminum. A rigid, sturdy frame is going to require less energy to power it which makes your kicks much more efficient. The more rigid the frame is the less it will rattle around as well. If you are interested in doing a lot of tricks, you may prefer a looser frame that has more give. There are also many considerations that you will make concerning the wheels of your scooter. Wheels are very important and will affect the way the scooter rolls. We’ve listed all these characteristics below. Regular wheels on a scooter are usually between 100-110mm. These are the standard wheel size that most standard scooters are equipped with. This size wheel is good for riding on a regular scooter and performing different tricks. Large Wheel Diameter – A wheel that has a larger diameter will measure 120mm or more. The larger wheels are much better suited for riders that are cruising from one place to another. They are faster rolling than the scooters with standard sized wheels and you’ll find that you won’t have to push as much. You will travel farther on one push with a scooter with larger wheels which makes commuting much easier and more efficient. Larger scooter wheels offer riders a smoother ride as well and absorb the shock of bumpy roads and sidewalks much better. Small Wheel Diameter – Smaller wheels are well suited for the rider that wants to perform tricks. This is due to the enhanced maneuverability. Wheel Material – The majority of scooters have wheels that are made from polyurethane. (Also called urethane or PU) This strong material offers a ride that is durable and smooth. Wheels can also be made of plastic or PVC. 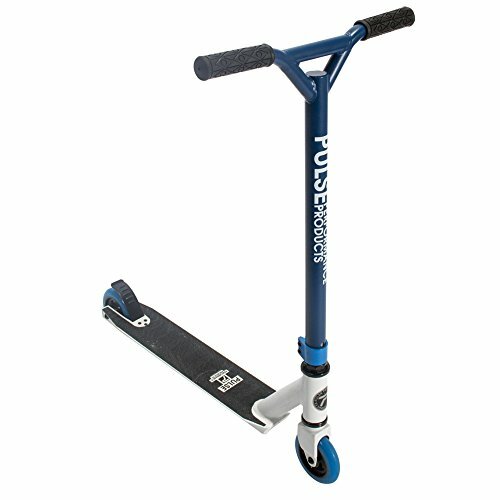 This is most often seen on scooters that are specifically designed for children and while they are durable, smoothness will be somewhat lost. Wheel Width – Wider scooter wheels will offer the rider more stability which can be very important for younger children or adults just starting out. Wheel Durometer – This measurement has to do with the softness or hardness of the scooter wheels. If there is a durometer measurement for the scooter you are considering, you will most often see a rating that is between 74A and 88A. The lower the number is the softer the wheel will be. Softer wheels are better for shock absorption but they will wear out faster as well. Wheel Roll Resistance – Speed and quality of your scooter will be determined by something called wheel roll resistance. The less resistance the wheel has the faster the scooter will roll. All of the energy you expend when riding a scooter goes to overcoming whatever wheel resistance the scooter has. For this reason you will be doing yourself a favor by choosing a scooter with high quality wheels that are much better for longer distances or longer traveling times. Another factor that determines the amount of wheel roll resistance is the size of the wheels. The larger the wheel the less resistance you will experience. Handlebar Height – The best handlebar height will be the one that reaches the waist of the rider. Handle bars that are too low can cause awkward hunching and those that are too high can affect scooter control and can lead to tip-overs or accidents. Weight of the Scooter – Remember that lightweight scooters work very well for children because they are much easier to control. It’s also easier for a child to carry or an adult that ends up needing to carry it for their child. Heavy scooters usually mean stronger scooters as well which makes them suitable for adults. The higher the maximum weight is that the scooter can handle, the heavier it will be. Scooters that are designed for stunts are heavier as well because they need to be able to handle the impact that doing stunts will cause. Scooter Bearings – Bearings are important to the quality of the scooter. If you see a rating from ABEC this is in regard to the bearings the scooter has; the higher the rating the better the quality of the scooter bearings. This also means they will last longer. Bearing ranges can be from ABEC -1, ABEC-3 or ABEC – 5. The best quality scooter will most often have a rating of ABEC -5. Folding Ability – Scooters that have the ability to fold are great for many reasons. They are easy to travel with, easier to carry from place to place and easier to store as well. If you have children you are familiar with the fact that they get tired when out and about and may not want to ride or carry their scooter anymore. Some scooters even have long straps that make carrying even more convenient. Avoid folding scooters if you or your child wants to do stunts. Scooters are excellent for exercising, having a great time exploring the outside, traveling to school or work and much more. They are used by people of all ages and come in many different styles, colors and price points. With so many choices on the market you are guaranteed to find one that will fit your specific needs regardless of whether you are purchasing the scooter for yourself or a child or other family member. They make excellent gifts and can really encourage physical activity for kids and adults as well. The three top rated scooters we have featured above gave you three examples of high quality scooters that will last a long time and that will stand up to the rigors of even daily use. This guide has also provided more information about different characteristics of scooters and how to determine which one is the right one for you. Take the time to do the research and homework on the different types of scooters available so you can spend your money wisely on a scooter that will fulfill all your needs. Introduction The Federal Reserve Bank of the United States is responsible for putting coins into circulation after the United States Mints have made them….